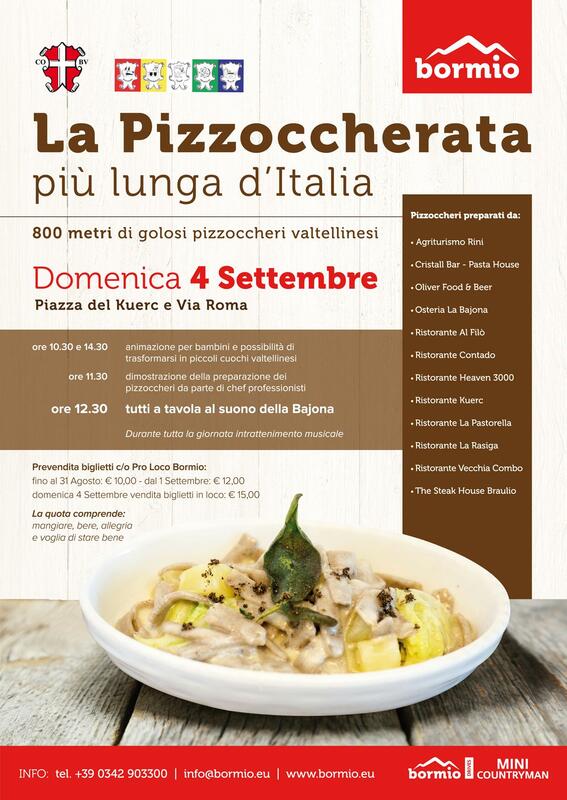 On Sunday the 4th of September, Bormio will host the longest “pizzoccherata” in Italy: along Kuerc square and Roma Street, more than 800 mt of tasteful pizzoccheri, served with water, wine, a slide of cake, a good liqueur and a cookbook, as a present. In addiction, the day will be filled with many other amusements: from 1030 till 14.30 the youngest ones will be able to be chef for one day and will enjoy many funny activities created just for them. At 11.30 real chefs will show everybody how to make pizzoccheri, the best way to practically see how this dish has to be cooked. And, finally, at 12.30, after the bell Bajona rings, evrybody can take a seat and eat the gorgeus pizzoccheri. When you buy your ticket you can also choose which restaurant will cook for your pizzoccheri. The following restaurants will be involved for the day: Agriturismo Rini, Cristall Bar – Pasta House, Oliver Food & Beer, Osteria La Bajona, Ristorante Al Filò, Ristorante Contado, Ristorante Heaven 3000, Ristorante Kuerc, Ristorante La Pastorella, Ristorante La Rasiga, Ristorante Vecchia Combo e The Steak House Braulio.